Exciting plans are being made to build upon the major successes achieved by “Sand House – The Elephant in the Room” in 2012. Proposals are in hand to take all the elements of that short-term project, enhance them significantly, incorporate new ideas, and present them in a permanent venue in central Doncaster. This page is aimed not only at outlining the proposals, but also inviting you to get involved. 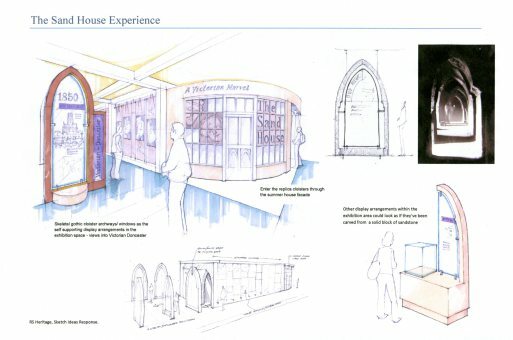 Our short film explores some of the exciting ideas for the permanent visitor attraction, The Sand House Experience. Please follow @sandhouseman on Twitter to keep up to date with developments on this project. You can also find us on Facebook by clicking here. The components of the 2102 exhibition will be greatly expanded, to include a replica of some of the Sand House tunnels. Visitors will be able to walk through and admire the remarkable carvings, while learning the story of the Sand House through a range of media. The house’s Long Room will also be evoked in the interior design of the venue. But the most exciting part of the project will be the opportunities that it will give for skills training and education. Out of all the hugely positive feedback that came from “Sand House – The Elephant in the Room”, some of most enthusiastic comments related to the hands-on sand sculpture sessions. They ranged from a 5-day training course undertaken by local artists, through half-day workshops for school parties, to family taster sessions. Sand sculpture provides a wide range of opportunities to develop artistic, technical, practical and social skills in ways that few other activities can match. It is also great fun and inexpensive. The proposed Sand House project – current working title ‘The Sand House Experience’ – will include a permanent sand sculpture studio within the venue. Under the guidance of experienced sand sculptors, groups of trainees of all ages will learn and have fun. Many of the sculptures and carvings that they create will become temporary features of a frequently changing exhibition. Professional sand sculptors will produce work too. Imagine regularly seeing more exhibits of the quality and sheer impact that the ‘Elephant and Mahout’ displayed in 2012. On 1st October, 2014, agreement in principle was reached with Manna Community CIC to collaborate on The Sand House Experience. Manna is an established Community Interest Company with an experienced Board of Directors. Its Directors have been involved in delivering a number of other projects of community benefit over several years. They will use their skills and expertise in company management and their network of professional advisors to support the project team in bringing ‘The Sand House Experience’ to fruition. In addition to Manna’s involvement, we have also had invaluable input from companies preparing preliminary designs and estimates. We are grateful to Groundworks Architects and RS Heritage for everything that they have done. We would also like to thank Aberration Films for producing the promotional video for us. There will certainly be a role for volunteers when the venue is up and running. In the meantime, we are likely to need help in various ways and we shall post appeals for such help on this website as time goes on. You can find out more by clicking on the following links. You can get in touch via the Contact us page. I really would greatly appreciate your assistance in making this exciting new Sand House project a reality. Please contact us if you are interested in helping in some way.